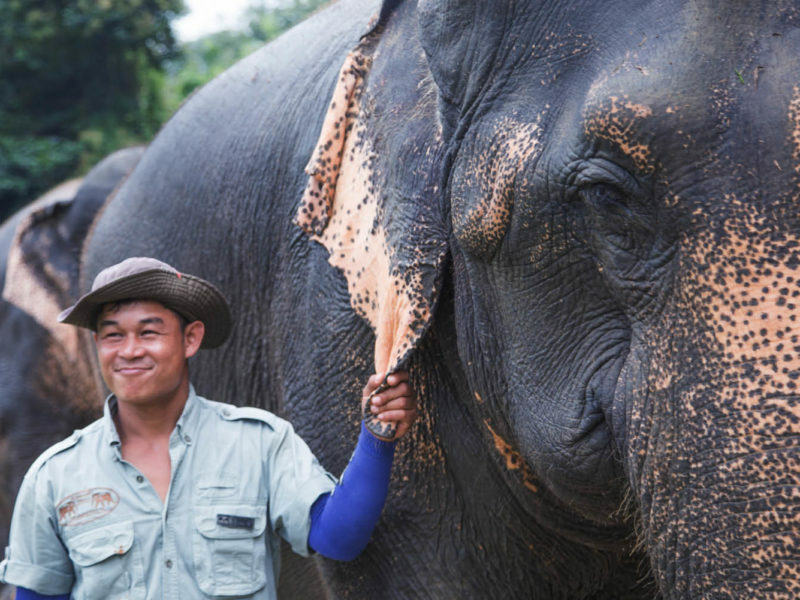 A mahout and his elephant, at Elephant Hills, about three hours north of Phuket (photo: Kara Murphy). Ethical encounters with endangered Asian elephants – where you observe and possibly interact with them but refrain from riding – can be a highlight of visiting Thailand. Just make sure to do your research when choosing an elephant encounter. Twenty-two minutes: that’s how long it takes to fall in love with an Asian elephant. Within that time, I’m privy to several of 53-year-old Moddaeng’s behaviours. I watch as she lolls in a pond with two of her pachyderm mates, submerging and rubbing her body against its muddy banks with joyful abandon. I walk alongside her as she ambles steadily towards the bathing area, awestruck to be in the presence of such a mighty, gentle, beautiful creature. I have a turn hosing mud and dust off her wrinkled skin, and am giddy with wonder when she politely requests a drink, curving the end of her trunk skywards beside the hose and allowing me to fill it to capacity. And, finally, I gaze into one of her kind eyes and, filled with affection, lightly kiss her trunk as she patiently allows me into her personal space for a photo. 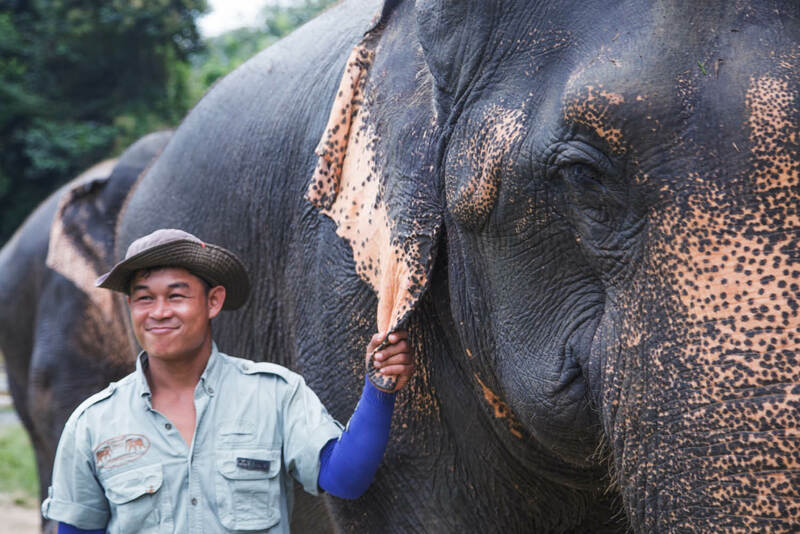 Moddaeng is one of 14 elephants – all female – here at Elephant Hills’ elephant park, an eight-hectare space nestled beneath dramatic, jungle-clad, limestone mountains in Thailand’s Khao Sok National Park, about three hours north of Phuket. Elephant Hills operates two luxury jungle camps – a floating camp set on a man-made lake, and the Elephant Camp, about a 10-minute drive from the elephant park. A few of the 14 female elephants at Elephant Hills (photo: Kara Murphy). The ecstatic faces surrounding me are evidence of that. No fellow visitor appears to be yearning for a position atop these elephants, a place that doesn’t allow you to see their sweet expressions or witness the tenderness in their eyes. Instead, this more down-to-earth encounter has each of us soaring on the inside, grateful to have the chance to be so close to these lovable creatures. Since introducing the non-riding experience, Elephant Hills has won multiple awards for ethics in animal welfare and sustainable tourism and has worked to improve its practices. The mahouts are trained Karen Hilltribes men, says Chell. “We work with them because of their calm nature and gentle ways around the elephants.” During daylight hours, the ladies socialise and interact with one another in the free roaming pens, he explains. At sunset, their mahouts use food to lure them to chain-free (since early 2017) individual pens, where the elephants can continue touching and interacting with one another. Elephant Hills’ Elephant Camp covers more than 8 hectares and offers space for the elephants to roam freely (photo: Kara Murphy). When visiting Thailand and other Asian countries, you can show your love for this endangered species by doing your research prior to travelling. If you’re seeking an elephant experience, choose one that genuinely focuses on elephant welfare, species conservation, and meaningful interactions and/or observation rather than rides, shows and tricks. Select a place where the elephants haven’t been poached from the wild, where they’re free to roam and interact with one another and they aren’t chained or abused. Volunteer and elephant sponsorship opportunities are available in some locations (for example, Elephant Nature Park in Chiang Mai), and, at Elephant Hills, you can make donations that benefit elephant hospitals and wild elephant conservation projects. And, of course, never, ever buy ivory products. “ . . . . The reality that elephants can be ‘trained’ to serve human demands. . . . . basically through torture.” Yup. Saw it and will never forget. Even the mahout who knows the elephant best is drawing blood with his sharp metal instrument while sitting behind the elephant’s head. Pity the poor Asian elephant that allows puny humans to dominate it unlike its more independent African cousin that will crush to jelly any human that dares try to conquer it. Don’t ride an elephant or thrill to its trained tricks. May its screams of pain fill your head if you do. Blessing upon those who sincerely try to rescue worn out or abandoned working elephants. The poor creatures after years of captivity can no longer be returned to the wild.